Trusting further in basic goodness and daring to experience the sharp edge of reality, we move forward with gentleness, increased awareness, and inquisitiveness about the world, as it is. We find that we can extend ourselves to others fully and with kindness. 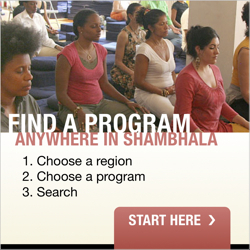 This is the fourth weekend retreat of the Way of Shambhala path of training.